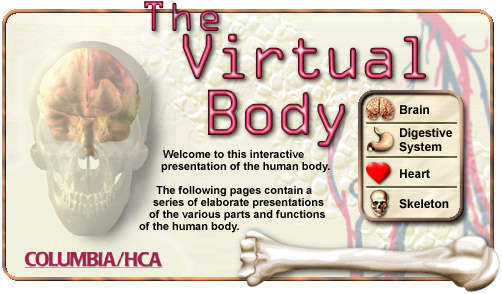 NOTE: The Virtual Body was built with Macromedia's SHOCKWAVE technology. To view it, you must first take a few moments to download the Macromedia Shockwave Player Plugin and install it on your local computer. Directions for installing the plugin are included with the downloadable file. All content and artwork is the property of Columbia/HCA Healthcare Corporation. All rights are reserved and permission to any content or artwork should be obtained from Columbia/HCA Healthcare Corporation before use. "LifeART 3D Super Anatomy Images Copyright 1996 Techpool Studios Corp. USA."